Remember last week when Derek went off on a tangent about butter and kittens? Well, webOS 3.0.2 hit and he got just that. And so did all the rest of you TouchPad owners. It’s something Derek and Tim are likely to discuss tonight when the launch into the latest edition of PalmCast Live! As usual, things will be kicking off at 8PM Eastern time tonight – that’s 5PM Pacific, midnight UTC, and noon tomorrow in Guam (although it is already tomorrow in Guam). And as usual, we’ll be burning through your questions from Twitter in lightning round fashion; just include the #palmcast hashtag in your tweet so we see it and give you the thoughtful answer you so justly deserve. So point your browser right back here tonight at 8PM for the best live webOS podcast you’re going to listen to all night. 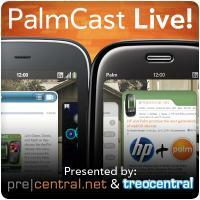 It’s PalmCast Live!